See that? 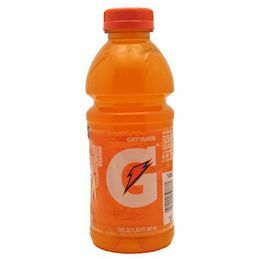 That’s what a 20-ounce bottle of Gatorade looks like. I ran six miles this morning. After my run — after burning 600 to 700 calories — I was thirsty and had a couple of bucks on me. I wanted to replenish my electrolytes. I wanted a Gatorade. I walked into a deli and bought a Gatorade. WHICH WOULD HAVE BEEN ILLEGAL TODAY IF MICHAEL BLOOMBERG HAD HIS WAY. Political–a Republican could argue that if the government weren’t dabbling in paying medical bills, this wouldn’t be its problem in the first place. Religious–I’m not religious, but pretty sure there isn’t a major religion that has anything to say about soda sizes. Economic–One could argue it hurts businesses (or gives certain kinds an unfair advantage). One could flip the script on Bloomberg and point out that many people–including religions, communists and some mental-health scientists–don’t think it’s healthy for one man to have that much money all to himself, so perhaps we should restrict that. But my friend Shawn made this point the other day and it’s actually the only argument that matters: It’s my body and I do what I want to. Previous Post Excerpt: How About a Taste of Bacon and Egg Man? Next Post Bacon and Eggs and FILTH! Yeah yeah, but the fact remains – sugar cane may have actually evolved to control us. Then it lost out to corn.